1. Preheat the oven to 150˚C, gas mark 2. Sit the ribs in a large roasting tin with the vegetables, garlic and star anise. Pour the beer and beef stock into a small pan, bring to the boil, then pour over the ribs. Cover the tin tightly with foil and cook for 4 hours, then set aside to cool. 2. Once the liquid is at room temperature, remove the ribs and transfer to a large plate. Cover with cling film and chill for 2 hours or overnight. Strain the liquid from the roasting tin into a pan and skim off as much fat as possible. Bring to the boil and reduce by 2 / 3 , until thickened and glossy. Remove from the heat and whisk in the barbecue sauce. 3. Preheat the barbecue for direct grilling and take the ribs out of the fridge to come to room temperature. Mix all the slaw ingredients in a bowl; season. Brush the ribs with the sauce, then barbecue for 10 minutes, turning and basting with the sauce regularly. 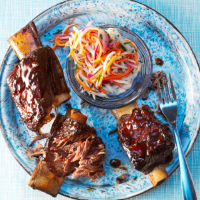 Take the ribs off the heat, give them a final brush with sauce, then serve with the slaw, remaining sauce and gherkins.